A small subset of the Astrobiters (and space turtles?) 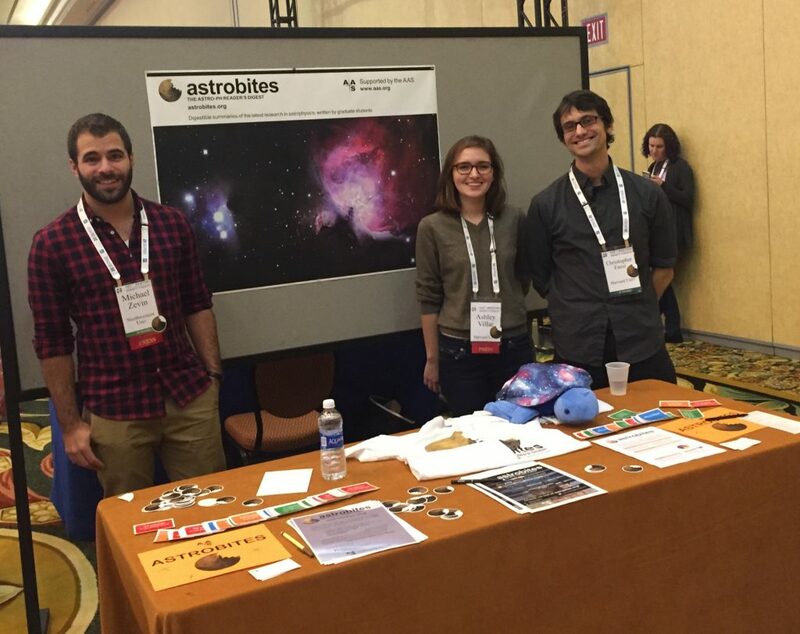 at large at AAS 229. American Astronomical Society President Dr. Christine Jones kicked off AAS229 by welcoming everyone to the meeting here in Grapevine, Texas. She highlighted many advances in astronomy over the last several decades, including our better understanding of the age of the universe, the presence and magnitude of dark energy, and how we said farewell to our Solar System’s ninth planet, Pluto. She highlighted many exciting topics to be discussed throughout this conference: the explosion of the field of exoplanet research, and marked the landmark detection of gravitational waves announced this year by the LIGO collaboration. Additionally, advances in the fields of high redshift galaxies, black hole feedback, and star formation will be announced in the coming days, as well as some discussion of high altitude balloon missions and the effects of light pollution on the field of astronomy. Many new telescopes and space missions are on the horizon, such as WFIRST, TMT, JWST, E-ELT, and GMT, and several sessions will be devoted to developing and using these facilities. Planning for the Decadal Survey of 2020 is also getting underway. Finally, important discussions regarding our community will take place, such as the Town Hall on Racism = Power + Privilege, and events hosted by the Committee on the Status of Women in Astronomy (CSWA), the Committee on the Status of Minorities in Astronomy (CSMA), and the Committee for Sexual-Orientation & Gender Minorities in Astronomy (SGMA). It sounds like AAS229 is going to be great! Dr. William Bottke (Southwest Research Institute) started by reminding everyone that we know about an amazing diversity of exoplanets due to the explosion of exoplanet discoveries over the past 20 years. However, it is very difficult to study and understand small bodies like asteroids and comets because of observational constraints, as they are very small and impossible to see around other stars. These small bodies are tantalizing, as they contain many clues to how planetary systems evolve. He compared it to a crime scene: small bodies are the bone chips and blood spatters that tell us what happened in the past. Dr. Bottke then suggested that our solar system might have originally had another Neptune-like planet that was expelled at some point. He is trying to use some strange features in the orbits of planets and asteroids to see if an additional ancient planet may have been the culprit. An extra planet might help explain the existence of irregular satellites (comet-like objects that are found orbiting around all outer planets on highly eccentric orbits) and Trojan asteroids (asteroids in the same orbit as Jupiter, just ahead and behind in the orbit at different Lagrange points). By including this extra Neptune-like planet in dynamical models of the solar system, he can reproduce the existence of these irregular satellites and Trojan asteroids. Dr. Bottke emphasized that these are not clear evidence that our Solar System used to have another Neptune-like planet, but they are hints that we might be missing some things that happened early on in our Solar System’s history. Thanks to dedicated radio observations with the Jansky Very Large Array (VLA) in New Mexico, a team of astronomers has pinpointed the source of a repeating Fast Radio Burst (FRB) for the first time. These mysterious, highly energetic transient events have been featured on Astrobites a few times, and their physical cause remains unknown. Compounding the problem, due to the nature of single-dish radio telescopes, it is difficult to determine exactly where in the sky any short-lived event is coming from. A series of papers published today changed that with an array of radio telescopes and bit of luck. Casey Law illustrates how using an array of radio telescopes lets astronomers pinpoint the location of an FRB (small yellow circle). This is contrasted with the original detection by single-dish Arecibo (large yellow circle) which could only give a vague direction in the sky around the size of the Hubble Deep Field. During the press conference, a packed room of reporters and scientists heard from Shami Chatterjee (Cornell University), Casey Law (UC Berkeley), Jason Hessels (ASTRON), Shriharsh P. Tendulkar (McGill University), and Sarah Burke Spolaor (NRAO). They found a faint persistent optical and radio source within 10 milliarcseconds of the FRB. The host galaxy is at a redshift of z ~ 0.2, and it’s a small, low-mass star-forming dwarf galaxy. The FRB, named FRB 121102 after its initial date of discovery by Arecibo, is the only known source to undergo multiple bursts. Thanks to this, it was possible to pinpoint its location ten times more precisely than if it had been a single event. 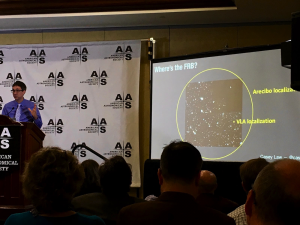 All of the presenters emphasized that while this is a very exciting development toward understanding FRBs, it is important to remember this detection represents a single member of the FRB population. Perhaps we stumbled across a weird one! It is too soon to draw conclusions about all FRBs based on observing just one, and doubly so given that we still have no idea what is physically causing them. 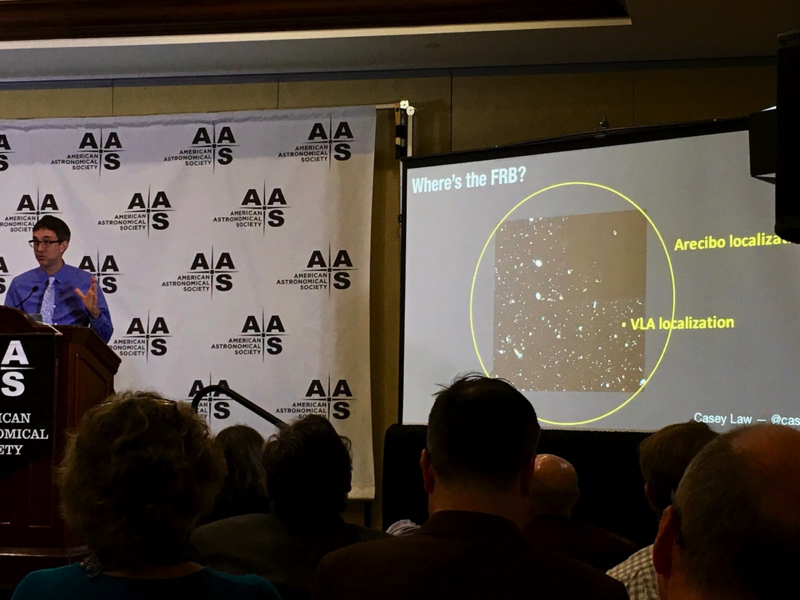 Sarah Burke Spolaor said this “great new astronomical mystery has broken open a new realm of science and discovery.” Not only are FRBs inherently fascinating, but they can also serve as tools to probe the contents of the universe between us and their host galaxies. Dr. Laura Lopez (Ohio State University) received this year’s Annie Jump Cannon Award. Her talk focused on stellar feedback, a catch-all term that describes the various ways in which stars deposit energy and momentum into the interstellar medium (ISM). Early in a star’s life, it has powerful protostellar outflows which last for less than a million years (a blink of an eye in the cosmic timescale!). Once these stars form, they continue to feed energy and momentum into the ISM. Most notably, the deaths of massive stars (a small fraction of the total star population) injects thermal energy into the surrounding ISM. Lopez highlighted the fact that feedback plays an important roles at both small (1 parsec) and large (> 10 kiloparsecs) scales, although our understanding of this complex process is plagued with systematic uncertainties. These uncertainties stem from many factors: the dynamic range of the effects, the variety of feedback mechanisms, and the lack of observational constraints. Lopez zoomed in on a specific case, the HII region 30 Doradus, where her team has been able to observe the full SED with high spatial resolution. With this data, Lopez can calculate the radiation pressure of various regions associated with different processes. This pressure measurement quantifies the feedback processes. To conclude, Lopez emphasized the importance of membership within our community, especially for typically underrepresented and underserved populations. Ever feel like astronomy and physics classes don’t spend enough time introducing students to cutting-edge research currently being done in the field of astrophysics? This afternoon, Astrobites tackled this problem in our first-ever workshop for astronomy educators on how to integrate Astrobites into the classroom! A group of 25 educators teaching high school, undergraduate, and graduate classes gathered for an hour and a half to discuss a variety of ways that posts on astrobites.com could be used in lessons to allow students to experience recent astronomy research related to fundamental concepts taught in the course. 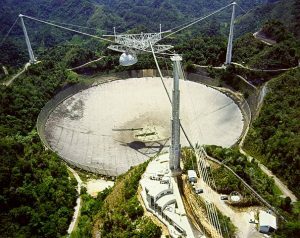 The second press conference of the meeting featured four speakers who discussed the most recent results coming from Arecibo Observatory, the 305-meter radio dish built into the landscape in Puerto Rico. Joan Schmelz (Arecibo Observatory / Universities Space Research Association) began the session by discussing Arecibo’s recent discovery of an object that affected observations of the cosmic microwave background (CMB; made by the WMAP and Planck spacecraft). The observations of small-scale structure of the CMB, which tells us about events in the early universe, can be contaminated by foreground galactic sources. Recent Arecibo observations in the Galactic Arecibo L-Band Feed Array (GALFA) HI survey reveal an unexpected foreground contributor to this signal: cold hydrogen gas associated electrons in the diffuse interstellar medium of our galaxy. This component will need to be included in future foreground masks when we attempt to better understand our observations of the CMB. Check out the full press release here. Next up, Victoria Kaspi (McGill University) discussed an unusual pair of objects: two “part-time” pulsars discovered as part of Arecibo’s PALFA survey. 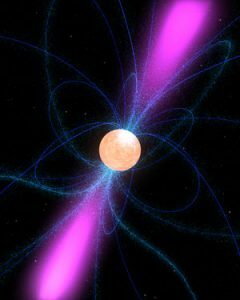 Pulsars are rotating, highly magnetized neutron stars that appear to pulse as the beam of radiation from their magnetic poles rotates in and out of view like a lighthouse. Unlike the majority of the 2,500 known radio pulsars, however, PSR J1910+0517 and PSR J1929+1357 are only “on” a small fraction of the time: 30% and 0.8% of the time, respectively. These intriguing objects suggest there might be many other similar pulsars out there that we just haven’t discovered yet due to the small amount of time they spend being observable! The two pulsars also provide some additional intrigue related to how pulsars age. As pulsars grow older, they “spin down” over time as they lose energy, gradually rotating less and less rapidly. Observations of these part-time pulsars suggest that the spin-down rate is dependent on whether or not the pulsar is “on”: the pulsars spin down faster when they’re on and slower when they’re off. More information is in the press release here. The next speaker was Tapasi Ghosh (Arecibo Observatory), who shared Arecibo’s contributions toward measuring the fine-structure constant, alpha. Alpha is a universal constant that describes the electromagnetic interaction between elementary charged particles; one practical example is that if alpha’s value were twice as large, atoms would decay twice as fast. Recent Arecibo measurements have placed constraints on the answer to an open question: is the fine-structure constant actually constant in time? Or has it changed over the years? Arecibo observations of a distant galaxy behind a foreground cloud of OH molecules allowed scientists to measure the fine-structure constant as it was at the distance of the galaxy, about 3 billion light-years away. They find that it has remained effectively unchanged: over 3 billion years, alpha has varied by no more than 1.3 parts in a million.You can read more about their research in the press release here. Christopher Salter (NAIC / Arecibo Observatory) rounded out the session with a discussion of results from the Arecibo-RadioAstron VLBI Active Galactic Nuclei Survey. This project links the Arecibo Observatory with the Russian RadioAstron satellite to simulate a radio dish of up to 350,000 km in diameter, able to make observations at unprecedented detail of the nuclei in distant active galaxies. Among the survey’s recent outcomes are new measurements of the nucleus of 3C 273, famed for being first quasar discovered. The project found that 3C 273 has a brightness temperature that is significantly higher than the maximum allowed by current models of how quasars shine, challenging our understanding of the physics at work in the vicinity of supermassive black holes. You can read more about their observations in their press release here. Stellar mass similarities in differing environments. The density of stars that reside in the galactic “field” differs by orders of magnitude compared to populations in globular clusters, yet the typical mass of a given star is unexpectedly similar. The initial mass function (IMF). This is an empirical function that describes the mass distribution of stars (i.e. how many stars of one mass there are compared to stars of another mass). From observations it appears to be nearly universal, however certain environments such as young star clusters and elliptical galaxies appear to have unexplained deviations. Star formation rate (SFR). The Kennicut-Schmidt relation, empirically formulated in 1959, proposed that the star formation rate per unit area is proportional to the gas surface density raised to some power. However, more recent findings may indicate that the star formation rate is instead proportional to the molecular gas surface density rather than the total gas surface density. Massive stars. We see them, we know they exist. But we still don’t know exactly how they form. Stars over 20 solar masses have enormous radiation pressure — so much so that hydrostatic equilibrium may not be maintained. McKee suggests that this radiation pressure problem may be reconciled with the help of Rayleigh-Taylor instabilities. Magnetic fields. Magnetism throws a twist on everything astrophysical, and the role of magnetic fields on star formation is still up in the air. Observations of the mass-to-magnetic flux ratio (in a sense, the importance of gravitation over magnetism) may be hinting that magnetic fields play less of a role in star formation than previously thought. The first stars. These stars are thought to form dark matter mini halos in the early universe that were on the order of a million solar masses. Simulations show this formation process and the lack of metals at these early times preferentially churns out massive stars. However, this is true specifically for the cold dark matter model, which is the most accepted model for dark matter. Through what McKee calls “cosmic archeology”, we may soon be able to analyze such stars to gain further insight into the nature of dark matter itself. This Town Hall, aptly entitled in equation form as Racism = Prejudice + Power, was a panel and discussion session held to address the systemic issues of racism in our society, and in the astronomy community. The session began with an introduction by Dr. Adam Burgasser, who specifically acknowledged that the conference we are at was held on land belonging to several indigenous groups and tribes. We were then introduced to the facilitators of the discussion, Dr. Jorge Moreno and Nicole Cabrera Salazar. Moreno introduced us to the Town Hall Axiom, that “we hold these truths to be self-evident that all people are created equal.” He emphasized the fact that people of color are massively underrepresented in the top 40 astronomy institutions in the US, with 90.7% white, 7.1% Asian, 1.2% Latinx, 1% Black, and 0% Native American. He also quoted several statistics about the incarceration of people of color, indicating the underlying racism in society that singles out particularly Black and Latinx people disproportionately. Moreno emphasized that centuries of oppression are at the root of this racism, setting the stage for the following discussion. We were then presented with guidelines for discussing difficult issues such as racism and equality. We then broke into small groups of three to four people to discuss three specific terms and what they bring to mind: race, social power, and racism. Afterwards, we reconvened, with many people sharing their thoughts and insights on these topics. Cabrera Salazar closed the Town Hall with some parting thoughts, quoting from a song from Solange Knowles’ most recent album, “Where do we go from here?” Our job, she notes, is to educate ourselves. Great work has been done on the topics of racism and equality, by people such as Audre Lorde, Patricia Hill Collins, Eduardo Bonilla-Silva, Lydia Brown, Kimberlé Crenshaw, and Maria Yellow Horse Brave Heart. It is also not the job of people of color to bear the brunt of the burden of fighting racism. White people should be doing the legwork because that is where the power lies. Moreno gave the example that in the same way that men should be fighting issues of sexual harassment of women, so should white people be the ones to fight racism in our community. Listen to people who do not lie on axes of privilege. Magnify the voices of people of color. Cabrera Salazar enjoined us to do this work, every day, because that is what it takes to defeat racism.